# Slice the onion finely, add vegetable on it, and cook over medium heat until it softens. # When the onion gets cooked, add the tomato paste and finely sliced peppers. When the colour of the peppers change a little, add peeled and finely sliced tomatoes. # Add 1 litre boiling water and salt. # While cooking it, knead the mixture of ground meat, cracked wheat, black pepper, crushed red pepper, salt in a separate bowl. # Rest the mixture for a few minutes, and then pick walnut sized pieces and roll them. 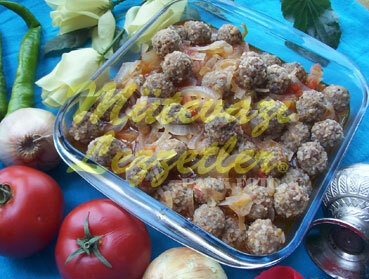 # Add the meatballs into the boiling mixture, cook over low-medium heat for about 20 minutes. Note: Loluk is a popular recipe of Malatya region. You must not wash the cracked wheat to keep the shapes of the meatballs after cooking.